The boot process can’t be completed successfully if a kext is being loaded from the console, no matter what kext it is. The solution is quite simple: since FakeSMC.kext can’t be loaded from console, it has to be installed to /S/L/E of the USB thumb drive. 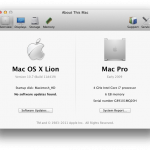 Copying it to /S/L/E should be enough, Lion automatically refreshes its kext-cache accordingly. Don’t forget to install the kext to the boot drive once the installation is finished. In contrast to developer preview 1 (build 11A390) no Ethernet connection was available in Lion developer preview 2. That’s because Apple removed a kext for the P6T’s RTL8169 onboard Ethernet chip. The IONetworkingFamily.kext from developer preview 1 works fine, just replace the existing kext in dev preview 2. This build boots even faster than the previous one. It’s a mere 7 seconds from the grey Apple logo to the Desktop using a SSD boot drive. 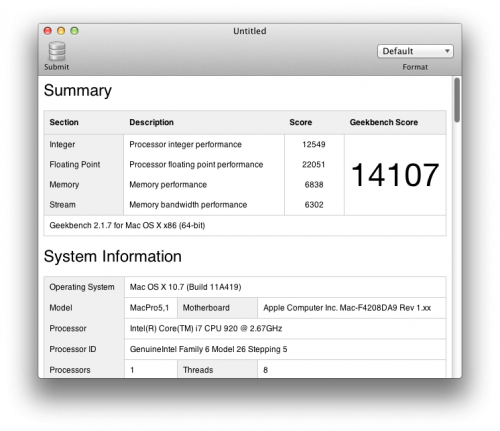 Geekbench shows a new record benchmark score for Lion developer preview 2 for my Hackintosh. I’m using an overclocked i7-920 CPU. I have a asus , several max os versios also including kalyway 10.5 and 10.6, when boot srarts I get a mac screen asking to resart. Also I got the dvd 10.7,..
What am I doing wrong?What do I need to get os x running my my new laptop. All the help is well appreciated. If you use a recent version of rc5 then this is the best choice at the moment. It’s nearly impossible to help from the distance because so many things can be done/set up differently and they all have an impact on system speed/system stability. ok so what bootloader is being used now? XPC is really picky to install. You have to do everything exactly the right way or it fails. 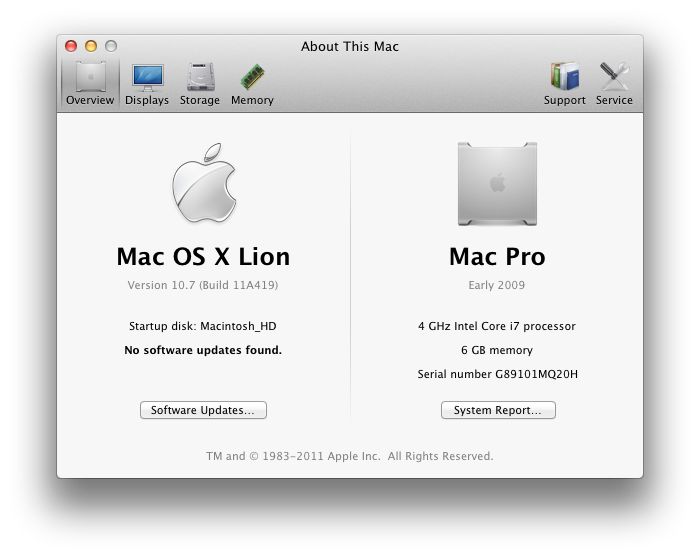 This post was about Lion dev preview 2 so you don’t have to use XPC anyway today. If you have a P6T standard board the kext I mentioned will work, but if it doesn’t, you may have other kexts installed that interfere with the AppleHDA replacement or the output is set to headphone. You probably need a kext to get sound, try searching for Marionez + AppleHDA and you should find the one I use on the P6T (non SE, non Deluxe). 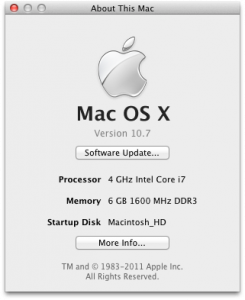 Chris, you need to have a kext like FakeSMC installed or your Hackintosh wouldn’t boot. Mac OS X does some checks if it’s running on genuine Apple hardware and that’s where FakeSMC comes in. The error you’re seeing is most likely not related to it. I installed lion with no issues at all. I am running a p6t with an ati hd5850. The problem is that the boot time is slow. I have all thee necessary kexts installed except for the fakesmc.kext. Is it possible this is what is slowing my boot? I booted in verbose and it takes alot of time on the ACPI state which is set to S3. if you could link me to the fakesmc.kext you used, or make any suggestions it would be most appreciated. That’s the Lion DP2 8169 NIC driver. You may have to set it to gigabit ethernet manually since at least in my case it doesn’t do so when set to automatic. Please be aware that Realtek’s own implementation of the 8169 NIC driver is the most reliable driver/kext for Lion. It auto-detects 1 GB connections and supports multicasting, which is something the Apple driver seems to have issues with when set to gigabit ethernet. Do you have a link to the IONetworkingFamily.kext file you are referring to? Thanks! It was saying something about your computer or device is not recognized. However, I follows a how-to and edited my com.Apple.Boot.plist as well as verified my ethernet was set to en0 and it fixed the problem. At first it didn’t work, but after I restarted a few times it did. Thanks for the response. Does the app store work for you? Yes. Are you seeing “No GUID is available. Contact support for assistance”? Now my graphic card 9800GT is still not working.. even putting in NVEnabler64.kext. You may want to try his advice. You have to insert the exact ID for your Nvidia card though. – i7 930 2.8GHz , 6 G RAM. The XPC boot fine and select to boot the OSX Base System..select “English” …and Mac OSX installer loaded…. localhost OSInstaller: No mutable product specified in NVRAM. localhost OSInstaller: Couldn’t find Mac OS X (Server) install data. I have a prefect Hackintosh and now I am stuck …Any help? Did you copy the installation packages to your USB boot drive? 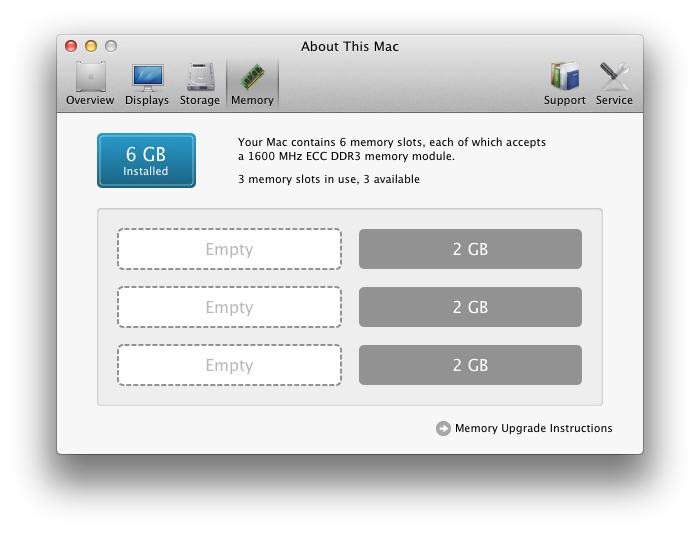 Just restoring the .dmg to a boot stick is not enough in Lion. Try to merge the information from my posts with a Lion installation guide for Hackint0shes (you’ll find some using Google). i’m still fighting with my 8800GTX to work without luke ! tried with NVinject, NVenabler,Natit, DSDT + Gfx fix (work withleo & SL) but without success ! don’t know what i can do more ! (all the descripted method works with my 7600gt) ! If you have any ideaa, i’d be pleased! I just found out why I don’t get an Ethernet connection on my P6T. Apple dropped the AppleRTL8169Ethernet.kext in dev preview 2. Reinstalling the kext in the Plugins folder of IONetworkingFamily.kext will solve this problem. @lord_webi: I’m using a rather aged Nvidia 8800 GTX.